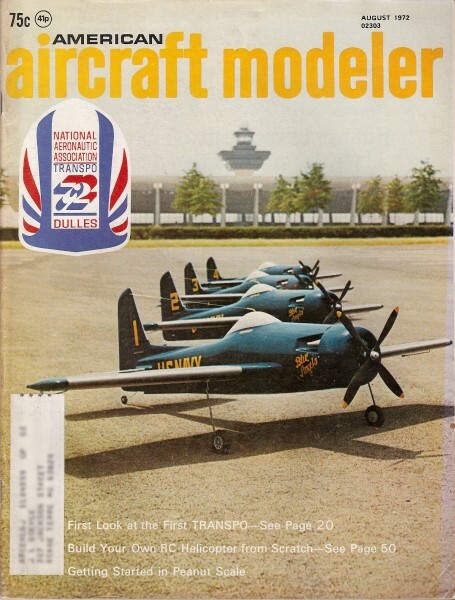 Don Berliner wrote a historical article about the Bellanca 28-70 Irish Swoop racer for the August 1972 edition of American Aircraft Modeler. Bjorn Karlstrom provided one of his masterpiece 4-view illustrations. I scanned, OCRed, and posted the contents for your convenience. 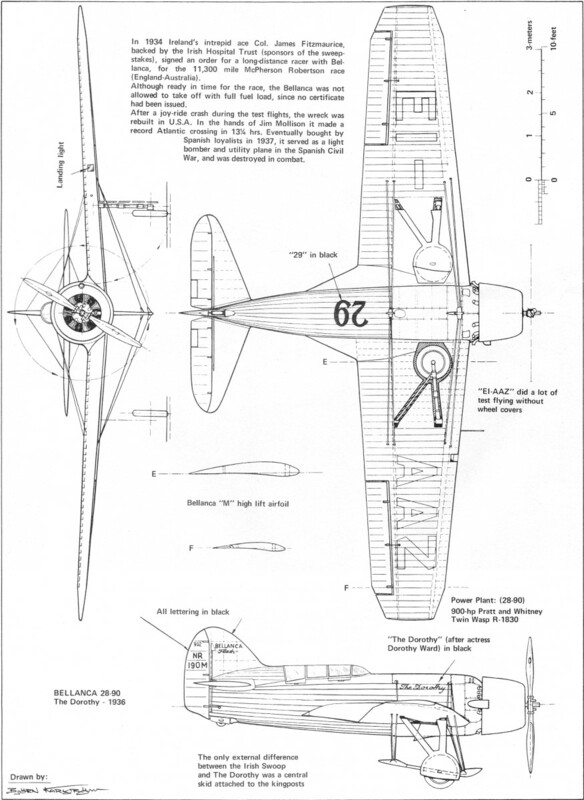 The Academy of Model Aeronautics still provides full-size drawings and plans for most of the airplanes featured over the years. The latest airplane to carry the grand old name of Bellanca is nothing more or less than a slightly modernized old Aeronca Champion. As unexciting as this seems at first glance, it is yet one more sign that the goal of Bellanca is to do more with less than anyone else. The Champ, known throughout its long first life as one of the finest little touring/ training two-seaters ever built, is now ready to provide even more economical flying than its companion on the Bellanca assembly lines - the aerobatic Citabria. Practical, enjoyable flying at minimum cost is certainly a ·worthy goal, and could well be imitated by other manufacturers. But such was not always the guiding principle at Bellanca. No performance and efficiency were long the qualities for which the late Guiseppe Bellanca was known all over the aviation world. And perhaps even more than for those, Bellanca was renowned for the novel ways he achieved them. Like wide-chord lifting struts, and a tri-motor transcontinental racer with two Menasco engines and one Ranger engine! Because of Bellanca's reputation for being able to do things better by doing them differently, an order was received in the late spring of 1934 for an airplane to win the upcoming MacRobertson Race from England to Australia. The pilot, Col. James Fitzmaurice, was spon­sored by the Irish Hospitals Trust and wanted an airplane capable of flying 3000 miles non-stop at 235 mph. And he wanted it to be ready to start the race in less than five months! Such was the confidence he had in the name of Bellanca. 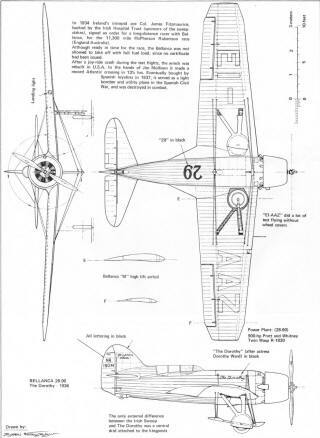 Construction began early in June 9, 1934 and the first test flight of the Model 28-70 (for 280 sq. ft. of wing, and 700 hp) was made three months later, on September L After some delays in shipping the prototype, it finally reached Mildenhall aerodrome (now the site of a USAF base in England) just four days before the October 20 scheduled start of the race. Named the "Irish Swoop" and licensed in Ireland as EI-AAZ, it was all ready to race and then the officials stepped in, as they still seem to do at unfortunate times. Be­cause of limited testing, the airplane had not been cleared at its maximum design loaded weight of 8350 lb. which was to have included some 600 gallons of fuel, weighing 3600 lb. The officials refused to let it take off at more than 5350 lb. which would have limited it to just over 100 gallons and forced it to make about 20 refueling stops. Fitzmaurice felt he would thus have no chance to win the race under such a restriction, and so he withdrew. Renamed the "Flash," 42 Bellancas were purchased by Spain during its civil war, 20 more by the Chinese to fight Japan. Some ended up in Mexico where they were equipped with machine guns and bombs. Wing Area - 278.8 sq. ft. Empty Weight - 4450 lb. Loaded Weight - 7099 lb. Maximum Range - 800 mi. Initial Rate of Climb-2S00 ft./min. The Model 28-70 was returned to the factory, was slightly modified with an improved engine cowling, and then was seriously damaged in a landing accident during the continuing test program. It sat around until 1936, when it was rebuilt with a 900 hp Pratt & Whitney R-1830 Wasp engine in place of the original 700 hp P& W Twin Wasp Jr . The designation was changed to 28-90 to reflect the increased horsepower, and it was registered in the U.S. as N190M. At this time, a central skid was added to the bracing posts under the fuselage. Re-named "The Dorothy," it was purchased by English long-distance flier James Mollison, who immediately set up a new record from New York to London of 13 hours, 17 minutes, or about 260 mph. This was in October of 1936. A month later, Mollison headed south from London with the intention of breaking the record to Capetown, at the southern tip of Africa. A broken fuel tank forced him down along the banks of the Nile River, unfortunately, and the flight ended there. Sometime in 1937, he flew the airplane to Madrid and sold it to the Spanish Republican government, which apparently used it for high-speed reconnaissance during the Spanish Civil War. 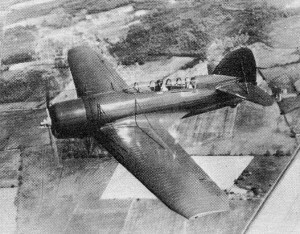 Even before they bought Mollison's prototype, however, the Spanish had ordered 20 of Bellanca's Model 28-90, by now called the "Flash." The order was made in the name of Air France, in order to get around the Neutrality Act which then forbid the export of military aircraft to certain foreign countries at war. The planes were painted up in Air France colors, even though it was common knowledge they were headed for Spain, but before they could be delivered, the law clamped down. Despite the fact that the Chinese­Japanese War was in full swing, the neutrality rules somehow failed to cover China, and the 20 Flashes were shipped to Shanghai. Military equipment was installed in China, but most of the airplanes were destroyed by the Japanese before they could be sent into combat. Another shady order for the Spanish was received by Bellanca in late 1937, this time for 22 airplanes in the name of a Greek flying school which did not even exist! The export application was turned down, but the airplanes were built anyway - all 22 being completed in just three months. Before they could be sneaked to Spain via Mexico, the Spanish Republicans were defeated by the Fascists, and Mexico took over the model 28-90B's to cover part of the debt owed them by the Spanish. A brief period of active service with the Mexican Air Force ended after two of the Flashes had crashed fatally, and the remaining aircraft were grounded. The Mexican Bellancas were set up to carry a pair of forward-firing .30 cat. machine guns, and a third .30 cal. in a moveable mount in the rear cockpit. Bomb racks could carry eight 120-pounders. Construction of the wing was quite conventional, with two spars and closely spaced ribs, covered with fabric. 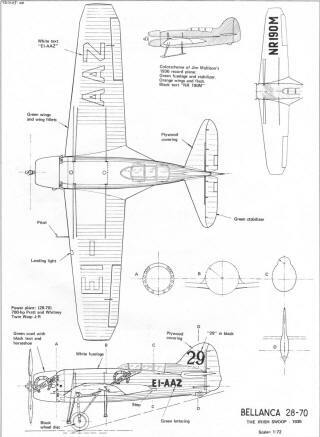 Ex­ternal bracing was composed of tie rods from the upper surface to the fuselage, and from the lower surface to steel supporting struts extending down from the belly. Fixed tail surfaces were plywood covered, while the control surfaces were welded steel tubing, covered with fabric. One of the novel innovations (for the time) was a cockpit canopy made of Plexiglas. In the long-range Model 28-70, all fuel was carried in front of the cockpit, in a 480-gallon main tank and a 120-gallon auxiliary tank. 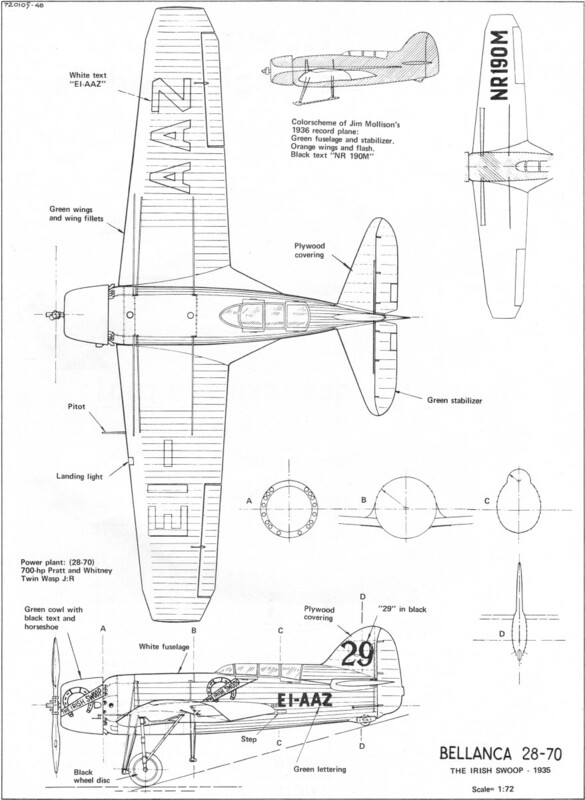 In the limited pro­duction Model 28-90, there was a single 150-gallon tank forward of the cockpit. And so, to the best of our knowledge, ends the saga of the Bellanca Flash. There were 43 built, with all apparently ending up in Spain, Mexico and China. According to all official records, not an airplane remains, though intriguing rumors occasionally float up from Mexico of mysterious airplanes in scrap yards. So far, none of these has concerned any of the flashy Bellancas, but it's always a possibility that at least part of one remains, somewhere. And if even a few miscellaneous parts can ever be found, the way will then be open for some ambitious antique restorers to work their magic. But this is probably only a dream.